Games, Pav Bhaji & Bhutta: What's Your Favourite Thing To Do At This Beach? When we think of Juhu, the first thing that pops up is the beach and everything around it. From colourful stalls that serenade us into fun activities on the beach, there’s a lot to do and admire, even though half of Mumbai thinks of visiting it at the same time. Here, we’ve come up with some fun things you can do on Juhu beach. The main entrance to Juhu Beach has a series of counters and makeshift stalls that sell chaats such as bhel puri, paani puri and sev puri, varieties of golas, from the traditional kala khatta to the intensely amber coloured ‘butterscotch’, dosa counters, chai stalls, pav bhaji stalls and so much more. Owners of eateries are standing in line showing off their menu cards to appeal to your stomach and succumb to the temptation surrounding you. A plate of paani puri is around INR 30, while bhel puri is priced at INR 50. Golas – depending on whether you want it classic or with malai – are also priced in the same range. 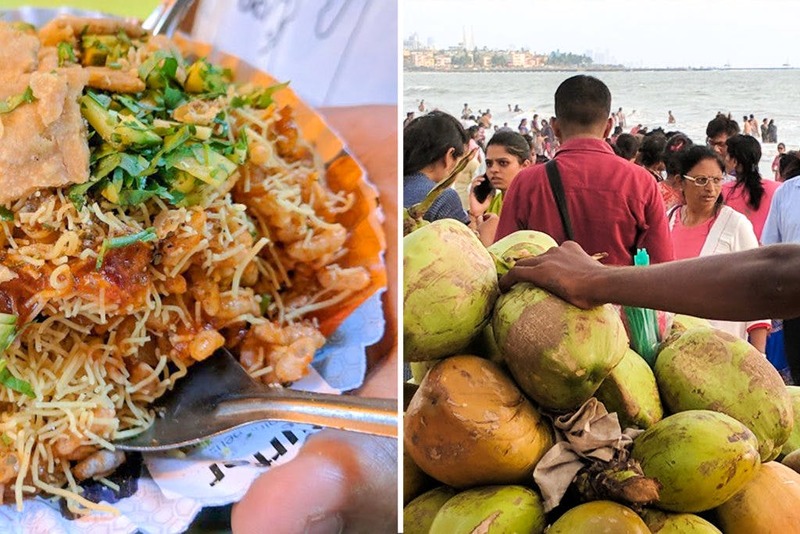 Beyond this, walk along the beach shore and sample hot bhajiyas, a variety of cut fruit platters, coconut water, bhutta (they make it any way you like) or even juice stalls to keep you going. All of them are priced in the range of INR 20 to INR 90. You can enjoy a horse riding on the beach. Apart from this, you are bound to see acrobats, dancing monkeys, cricket matches, toy sellers are the other attractions (bubble makers and even glow balls for kids). Kids could try their luck at the shooting galleries where they fire balloons with air guns. The price range, of course, starts at anything from INR 50 and goes upwards. If you’re in the mood for a picnic with friends or family (although we recommend you come early for this), you can enjoy the sunrise or sunset and have your fill of all the local delicacies. Juhu’s a place for morning walkers and runners to stretch their legs. After all, they say that walking or running on wet sand is the best for the body because of the surface’s soft nature. You can also bring in your pet for a walk on the beach. Just ensure that you clean up after they are done with their business, and always keep them on a short leash because of the strays that are found running around the area. Make sure that you visit the beach early in the morning if you intend to go on a long run because, after 8 AM, you won’t be able to walk a few meters without banging into someone. The southern end of the beach is quiet, so make sure you head there.